The rich, dark variety from my first BKT memory would probably be considered Hokkien or Cantonese. Both are made with the addition of dark soy sauce and sugar; the latter differs basically in the addition of dried herbs. 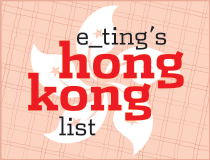 Sometimes Hokkien and Cantonese are just called Hokkien together. Anyway they're the prevalent styles in Malaysia. 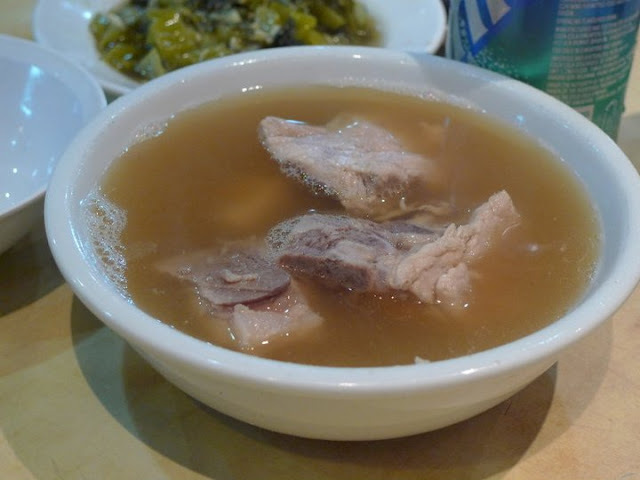 In Singapore, the Teochew variety reigns - it's a clear, consomme-like soup with lots of white pepper. The Teochew/Singaporean samples I'd had previously were thin, overly peppery dishwater-esque broths, which made me think that Singaporean BKT just isn't my thing. But Founder changed that. This was still a relatively light soup, but it was packed with great layers of flavour; such depth that only an old master stock could produce (we joked that the soup base might have been around since Singapore's independence, just like a baker's natural sourdough, or a wonton noodle shop's soup). I could taste the unique sweetness that can only be the result of pork bones spending hours and hours simmering slowly on a low heat. It rounded off the sharpness of the white pepper beautifully. We ordered the long "prime" rib and the normal cut-up spare ribs, and yes, the meat was supremely tender, but for me, Founder is about the soup. I can drink litres of the stuff, which is just as well because soup refills are free! (Not that all the celebs, whose pictures are plastered all over the walls, are here for refills...) The preserved vegetables were nothing to write home about. Next time I come I might try the liver too. 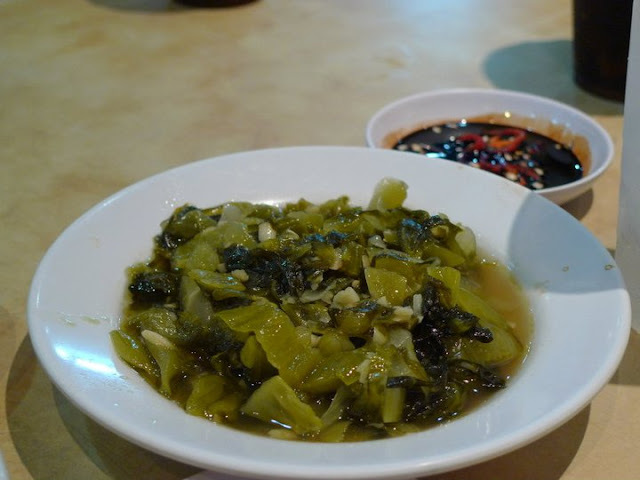 This is a Hokkien-style BKT I had last year at Zealand, Penang. I'm pretty sure it was just Hokkien due to the absence of herbs. Actually, it was absent of most flavours. It wasn't even all that thick and dark... Very disappointed, considering this was one of Chubby Hubby's picks. Apparently Klang is the place to go for BKT in Malaysia**. Klang it is next time then. 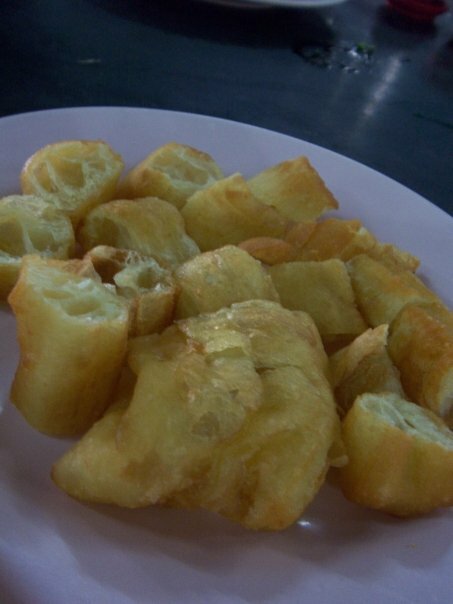 The youtiao (crullers) that often come with BKT - these from Zealand were pretty crap too. They'd absorbed too much of the coconut oil they were fried in... yuck. So, Founder - I'm so coming back, but probably really late at night (around 1am) when the crowds finally die down. 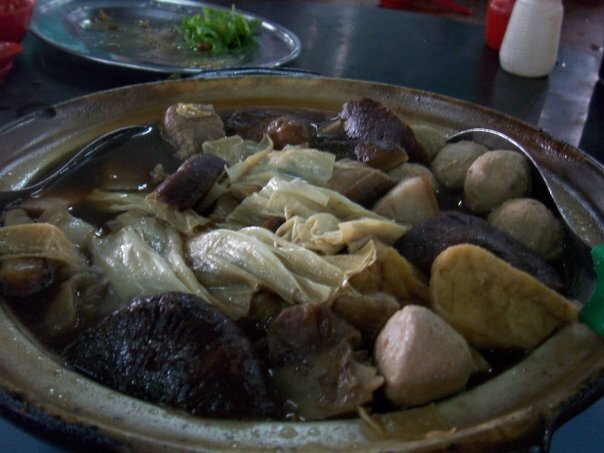 * The name Bak Kuh Teh is the romanised form of the Hokkien pronunciation of rou gu cha in Mandarin, or yuk gwut cha in Cantonese. The literal translation would be "meat bone tea". 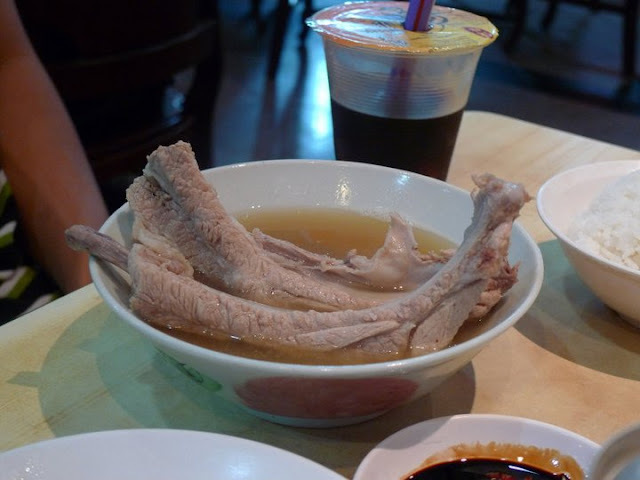 **There have been nasty disputes about the origin of bah kut teh. Some say it originates from Klang - the Malaysian Tourism Minister famously declared so in 2009, to the horror of many. In any case, legend has it that BKT was invented as a hearty breakfast for port labourers working dockside in Malaysia/Singapore. Often they'd only have time for one meal a day, so they needed something hearty and filling. (My dad adds that they put in herbs, garlic, pepper etc. to help defend against illness too - pretty much like how people take garlic supplements nowadays, I guess). 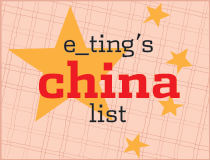 The Hokkien name, would suggest a Hokkien origin of sorts, be it by Hokkien (now Fujian) immigrants, or actually from that region in China? Anyway - that's the story.